I soldered in the new oscillator clock chip that Dan Tayloe sent me; and unfortunately, not much difference. And yes, I did re-read the correspondence I had with KD1JV to make sure I put it in the right way! The voltages are correct now; but still no receive signals on 40 Meters. At this point, I'm not sure what else may have been damaged by the clock oscillator being installed upside down from the get-go. A couple of weeks ago, I ordered back ups of all the active components that I have installed so far. I am going to put in a new voltage regulator as the +5V level seems a little low. That might just be due to the tolerance of my VOM; but I'll swap it out anyway for a fresh start. I will also swap out the 612's the 2N3904s and the 2N7000s. This is kind of frustrating and disappointing as I have successfully built a ton of Heathkits in my younger years. These included an HR-1680 receiver and a complete SB-104A transciever with all the station options and an HW-8 QRP transceiver in addition to many other Amateur Radio accessories. I also successfully built a complete Heathkit high-end stereo system. My more recent projects, an OHR 20/40 Meter "Classic", my K2, my K1, and several RockMites were all built without incident. Each was assembled with no difficulties and worked correctly upon power up. So it's not like I am a total newbie without any kitbuilding experience whatsoever. I guess I'll look upon this as yet another learning experience. If I get it working, that's all well and good; and if I don't ..... well, it's not like I'm looking for a cure for cancer; or trying to end world hunger. It's just a radio, after all. Still, there's something inside me (I have been called "a stubborn Polak" before) that does not like to acknowledge defeat. All I can say is that my first experience with ordering and building a Hendricks QRP Kits product hasn't been exactly "Sunshine, Lollipops and Rainbows". I'll keep you all posted. Continuing progress will be slow as I'm looking at a very busy work week and next weekend is full of family obligations. A little salt and pepper, please ?!? For the words in my previous post, I mean. Did it snow last night! To the point that I woke up to a scene that was totally white! AccuWeather.com was correct; and like a fool, I doubted them. Woe is me! 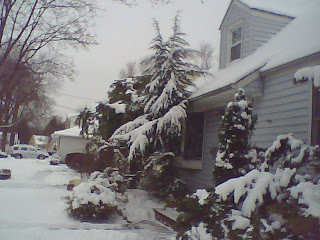 :) I had to shovel to get out of my driveway - the snowplows hadn't even touched the road. Thank God for four wheel drive - it got me into work today. As bad as the local streets were; the main highways were pretty good. The drive in was not "white knuckle" like it was coming home that day last week. It snowed pretty hard all morning; with the sun finally peeking through the clouds around 2:00 PM or so. All told, just over a foot (about 31 cm) of snow fell. The winds were vicious, constantly blowing snow into my face as I tried to shovel this morning; which is a bad thing when you wear eyeglasses! There are snow drifts in my driveway over 2 feet high (61 cm) in places. The good thing is that by the time I left work; the roads were pretty much clear down to the asphalt surface and were mainly just wet. That will be bad for tonight though; as we're quickly dropping below the freezing point. I am glad I don't have to drive anywhere tonight. So between two bouts of snow shoveling and a "normal" busy day at work; I am bushed! I am going to turn in early tonight; as I have to go back into work tomorrow. No normal weekend for W2LJ this weekend. Hopefully, this storm is turning out to be more hype than substance, at least in Central NJ. The snow accumulation has been about an inch - maybe. The main roads are clear and the secondary roads are slushy. The snow is wet and heavy and I'm glad I had so little accumulation to get rid of. On a positive note, I received my new clock oscillator ship in the mail today from Dan Tayloe. Bad news is, I might have to work through the weekend; so I am not so sure I'm going to get a lot of time to put it in. We'll have to wait and see. There's a 40 Meter Foxhunt tonight; and I am anxious to participate. However, I am also beat from an absolutely beastly day at work today. I may turn in early and forgo the hunt. I will see how tired I feel in 90 minutes, when the hunt begins. One of the things that intrigues me the most (and frustrates me the most) about Amateur Radio is the mystical qualities of propagation. Over the weekend in the DX Contest, I worked a good chunk of the world with 5 Watts. Latvia, Turkmenistan, Croatia, Kaliningrad, all of these were not a problem. Tonight, on the 80 Meter Foxhunt, I barely worked Dave AB9CA in Alabama! I called for over an hour and finally made a successful exchange with him at 0310 UTC . Yes, there was QSB; but for the most part, Dave was pretty loud into New Jersey. I was wracking my brains trying to figure out why Dave wasn't hearing me. Usually we have no problem - tonight was a struggle to say the least. Switching between the wire and the vertical had no effect. Finally, I began to vary my transmit frequency a bit more and must have stumbled my way into his passband. After that, I listened for the other Fox in Arizona, W7KXB; but he was just a whisper. And with only about ten minutes left in the hunt, I knew my chances to work him were "slim and none; and slim left town". And "slim" did indeed, leave town - I was not successful. But I suppose that is why they are called "Fox hunts" and not "shooting Foxes in a barrel"; but it does make you shake your head when you're hearing a guy fine, but are not being heard fine in return. Who said propagation was reciprocal, anyway? Today, I did something on the way home from work, that I don't do everyday. I turned on the VHF/UHF radio and listened some to the local 2 Meter repeater. And I heard two words that made my blood run cold - "Nor'Easter" and "snow". There were intimations being made about another winter storm to hit our area later this week. This is what I have to look forward to later this week. 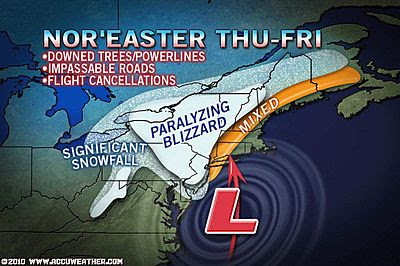 It's very disconcerting when you see the term "snow hurricane" being used in the place of "blizzard". It's also not good when they talk about an oncoming storm and use the words "monster" and "historical proportions". You can click on the map for a larger image. It seems all the QSOs follow a southwest to northeast line relative to my QTH. I did not work everyone that I heard, I basically just went up and down the bands, working folks at random. It was definitely not a contest effort; but more of a "Who can hear me?" exercise. Not terrible for 5 Watts and little time! Some good news was received this past weekend. The Cherryville Hamfest in Flemington, NJ, which traditionally kicks off the Hamfest season in our area is back this year after a one year hiatus! I thought for sure it was going to be a goner, but an e-mail from one of the local repeater clubs that I belong to has proven otherwise. I am very happy to see that this Hamfest has not gone the way of the dinosaurs and the dodo birds. The other thing that I wanted to post about is a new YouTube video that I discovered on Steve K9ZW's blog, "With Varying Frequency - Amateur Radio Ponderings". It is a new video on how to adjust and use a Vibroplex bug. I don't like to mine other people's blogs for material; but this is such an outstanding video that I wanted to relate about it here. I've been asked privately many times about a good resource on how to adjust and operate a bug. This one is superb! Thanks, Steve, for posting this. There was not much time to play around in the DX Contest today. My daughter had that cheerleading competition, which effectively took the entire day. I was able to get on for about a half hour before leaving for Mass this morning. 15 Meters was open and I heard a lot of European stations; and worked a few also. Didn't hear any VKs or ZLs, which disappointed me a bit. In all, in the very limited amount of time I put in, I worked about 50 or so stations. Time to start writing up some QSL cards! The Flying Pigs "Run For The Bacon" is tonight. I think I'm too pooped to do any running this month. I knew I was too pooped to pop! I worked the first hour and only made 6 QSOs. I guess everyone else is pooped too. I worked C6AKQ (N4BP) on 40 Meters - that was the highlight. VE3MO on 80 Meters was the loudest Piggie I heard while I was on. Now that I have the two antennas plugged into the K2 together, it is much easier to do an A/B comparison. Now, instead of flicking a coax switch, I just push a button and can hear the differences instantaneously. And what I heard tonight surprised me. On 40 Meters the HF9V is giving me better performance than the wire. I was hearing stations noticeably louder with the vertical. Now the backyard is covered with snow; so maybe the radial system is doing a bang up job currently being soaked in moisture from the melting snow. I don't know. But I was working stations with ease and got another "new one" tonight. HQ9R on 40 Meters. Yes, I've worked Honduras before; but not QRP - so that makes two new QRP entities for me today. In all, I've cherry picked about 50 QRP DX contacts today; and learned a few new things about my "antenna farm". Actually, it's more like an antenna flower pot as opposed to a farm; but it's all I have and I am enjoying it for now. I'm beat and off to bed. Cara has a cheer leading competition tomorrow; so my operating time will be VERY limited. 40 Meters was not nearly as fruitful tonight as the higher bands were during the daylight hours. I was hearing mostly Europeans and very loud stateside stations. I worked a few Germans and Poles and that was about it. Nothing too exotic on 40 Meters tonight. I pulled the plug early and will get up early tomorrow morning to see if I can possibly hear any VK or ZL stations in the morning. That would be cool to work Oceania again from NJ on 5 Watts! I did have another Homer Simpson "Doh" moment, however. I currently have three antennas. The G5RV, the Butternut HF9V (which got a workout today!) and my Inverted "L". Of all, the Inverted "L" gets the littlest use and I will probably take it down this Spring. For whatever reason, it is VERY noisy. Way noisier than the G5RV and even noisier than the HF9V - I'm used to the vertical being noisy. So I would say it's a safe bet to say that the "L" get used 2% of the time, or less. So that leaves the vertical and the HF9V as my two primary antennas. I have all three connected to a coax switch so I can choose between them. Suddenly it occurred to me ...... I have the built in antenna tuner in the K2 with TWO antenna inputs! I removed the G5RV and the Butternut from the coax switch and plugged them directly into the K2. No switch loss and when I switch between the two antennas, the K2's tuner memory kicks in and I'm set and ready to go. I wonder why I hadn't thought of this before! It's so obvious! Sometimes I feel so stupid! In the ARRL DX Contest ! Both 10 and 15 Meters are open and I am just going around randomly working stations that I can pick out among the madness. Boy, there sure seems to be a lot of guys who have trekked down to the Caribbean, particularly Aruba. I have heard more stations on the air from Aruba today than I think I ever have before. I guess all the snow and cold has made a lot of Hams from the colder climates with cabin fever make the move to a warmer venue. I should try selling my XYL on that concept one of these years! A new one for me via QRP has been Chile. CE1/K7CA has a superb set of ears and picked my peanut whistle signal out of the aether. That brings my QRP DXCC entity total to 104. I have to update the "entities worked" spreadsheet on my Webpage as I never included the very first one that I worked back in 1994, C2MV - Nauru. I am finding that on 15 and 10 Meters that I am having much more success with the Butternut HF9V that I am with the G5RV. When I wasn't working stations that were pretty loud to me; I decided to switch to the vertical and was getting picked up on the first, second or third call; when it seemed they weren't hearing me with the wire at all! In a few minutes, I have to take my daughter Cara to a cheer leading team practice. Then I will come home and probably spend a little more time on the bands. Once dinner time rolls around, that will probably be it for me until the night time. Jim W1PID is about one of the nicest guys you could meet, anywhere. Whenever I hear him on the air; he has a great signal and a friendly greeting. 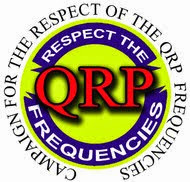 He is a boon to the QRP community. All that and he has great adventures, too! are two of his newest. Enjoy! And don't forget, this weekend is the ARRL DX contest. Band conditions have been the best we've seen in a while. Have fun getting some new ones, QRP style! I received a response from Dan Tayloe N7VE regarding the U11 50 MHz Reference Oscillator that needs to be replaced on my PFR3A. He has a spare and is going to pop it into the mail for me. Dan is the one who pre-mounts the SMT parts on the PFR3A boards. Hopefully, once I get that and install it, I will finally have the DDS LO signal that I need to get the receive section of the PFR3A working. Then I can continue on to the transmitter section. Other than that, not much is going on here tonight. Both 40 and 80 Meters are amazingly QRN free tonight. I have called CQ a bunch of times tonight; but have gotten no takers on either band. I am going to head down to the shack for a few more tries before heading off to bed. I have been on the air for about five days in a row now; and it is becoming addictive again. Getting on the air makes you want to be on the air, more and more. A 2fer and some Rolaids, please! If it's Tuesday night; and it's Winter; then it has to be 80 Meter QRP Foxhunt night! And tonight was nice - to start out with. The band was quiet, hardly any QRN at all. Very nice conditions for hunting Foxes. And hunt them I did; and quite successfully, too! Steve NØSM in Iowa proved to be the trickier of the two Foxes. His signal was up and down. QSB was a bit of a problem and I had to call for about 20 minutes before I snared him. Scott NØAR was easier, on the other hand. His signal was steady; and I bagged his pelt after calling maybe two or three times. So I got a 2fer, as it is called. I worked both Foxes and the feeling is good. While attempting to work Steve, though, I managed to get my ears bloodied when out of nowhere, K3IN started calling up the 3RN Net with a 50,000000 over 9 signal. The suddenness of the beginning of the net was a startling jolt. No "QRL? ", no "? ", no nothing. Thank the Lord for the K2's crystal filters! I was able to peel myself off the floor; go to the tightest filter and still listen for NØSM without developing a migraine. Yes, I know these nets are the backbone of the National Traffic System; and I realize that they have met on the same blessed frequency every single blessed night since Marconi was in diapers. But how about some courtesy? How about some good operating practice? How about asking if the frequency is in use before blasting away with a "3RN de K3IN" ????? Hmmmm ??? I know, it's like trying to shovel sand into the sea. You get nowhere and frustrated real fast. But being an established net, even a major NTS region net, does NOT excuse you from basic operating courtesies. You mean to tell me if these guys had to move up or down a couple of KCs, that the net would fall apart? If that's the case, then we're in worse shape than I had imagined. BTW, no answer or acknowledgment from QRPKits with reference to the e-mail I sent them last week; inquiring about obtaining a new U11 reference oscillator chip. I fired off another e-mail tonight. We'll see what happens. PS - A small point; but the closing signature line from here on out will include the "72" - "Best QRP" originated by Oleg Borodin. 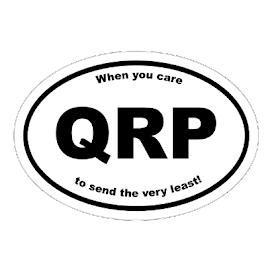 Since this is a QRP blog (primarily) it seems fitting. 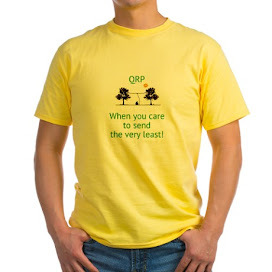 The "Buzz" on the QRP e-mail reflectors has been the suggestion that QRPers move their base of operations up in the 40 Meter band as a way of avoiding the increasing amounts of QRM around both 7.040 MHz and 7.030 MHz. After a posting from Prof. Arnie Coro CO2KK, it seems that many QRPers, frustrated by the QRM are willing to make the move. I for one, agree. I mean that's what we have VFOs for anyway, right? And for those that are crystal controlled, I see an opportunity for someone to make some business by offering crystals that would allow the move up above 7.100 MHz. With things going the way they are it seems the digital modes and WSPR are going to take over what was commonly thought of as QRP territory. I've never been an advocate for banging my head against the wall, so it seems like a good idea to me. There's a lot of spectrum up in that area that's barely being used. Might as well put it to good use. The SKCCer's have been hanging out in that area for the past few years. I think they could stand the company of a bunch of QRP enthusiasts. Those that don't adapt die ..... those that do, move on. Today is "President's Day" in the USA; a national holiday to honor and celebrate all those who have held the office of President of the United States over our 200+ year history. I know, as far as age goes, we're still "babes in the woods" compared to a lot of you other nations out there; but hey, it's a day off from work! But even a day off from work doesn't necessarily mean I can spend the day goofing off. There are chores to be done and places to go. BUT ...... I did get on 17 Meters for a few minutes this morning and worked UY5ZZ in the Ukraine and ES4NG in Estonia. I have worked Estonia before; but not since going totally QRP; so this is kind of a "new one" for me. It is SOOOOO nice to see the bands awakening. I guess it will be a slow wake up process as they've seemed dead for so many months now. But, I think that this is a good sign for this coming weekend's ARRL International DX Contest. I'm pretty confident that the bands won't go back to being COMPLETELY dead this coming weekend; so it should be a fun time. If you're a QRP Op and you find yourself struggling towards completing DXCC using low power, this is prime opportunity for you! If you're just starting, you should be able to harvest a bumper crop of new DXCC entities in your log. If you're close to finishing working your first hundred, then with sharp ears you should also be able to reach that first century goal. 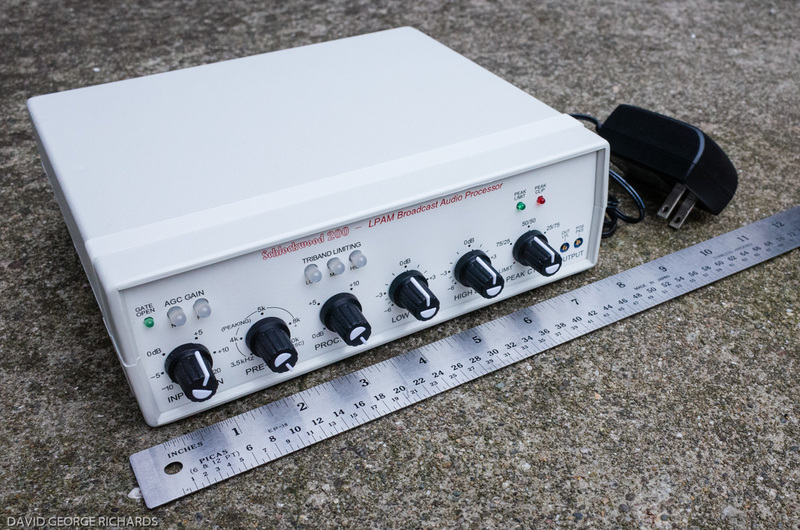 As for me; I'm just going to continue to see how many countries I can snare using QRP power levels. Estonia brings me up to 103, which 1s not all that far away from my regular QRO total of 133. A thought just occurred to me ...... I now qualify for the QRP-ARCI's "QRP DX" award! I am going to have to reprint out my application for ARRL's "QRP DXCC" and send it off to Jay Bromley. I really enjoy the QRP-ARCI's awards program. There is some personal satisfaction in qualifying for an award offered by a large QRP dedicated organization. Don't get me wrong, the ARRL's "DXCC QRP" award is nice; and I'm glad to have earned it; but the ARRL doesn't quite "get" QRP like QRP-ARCI does. Nice band openings this morning! I got home from Church this morning; and was actually able to spend a few hours behind the dial. It was nice to hear 20, 17 and 12 Meters busy with activity. One would have thought that 15 Meters would have been busy also; but I didn't hear any signals on that band. I sent out some CQ's for a while and got no answers. On 12 Meters I was able to work the US Virgin Islands, KP2HC and Belize, V31GT. On 17 Meters, I was able to work Belgium, OQ5M and Ireland, EI6IZ. 20 Meters yielded England. MØEDX and the Balearic Islands, EA6UN. I've heard and worked Jurek EA6UN many times with 5 Watts. He was simply pounding into New Jersey with a very good signal. I just wanted to say "Hi" to Jurek and to let him know that he was being heard well on the East Coast. Blue pins are countries worked today - red pin was heard but not worked. A little later, I was listening to a station running a frequency on 17 Meters. I was surprised to hear him confirm a QSO with my friend Bob W3BBO. It's rare but always cool when you hear a DX station come back to a friend of yours. However, this person wasn't giving out his call very often; so I gave Bob a quick phone call to ask him who he had just worked. I think he was taken a bit back by my phone call; and was surprised to hear from me. We usually confine our communications to the radio waves or Echolink. Turned out it was a Nigerian that Bob had worked, 5N7M. Soon after our call ended, this Nigerian had run out of stations calling him and started calling CQ again; and this time was giving his call quite frequently. Unfortunately, my 5 Watts wasn't making it; as he wasn't hearing me even when he wasn't getting any takers. Since I have never worked Nigeria before, I pumped the K2 up to the full 20 Watts out, figuring that I might get lucky enough to get Nigeria in the log. No such luck - even with the full K2 gallon. But that's OK, you know? Ol' Sol seems to be perking up these days, with activity being heard on bands that have been very dormant for a long time. I'll get another chance, I am sure. One of the key requirements for being a QRPer is patience. If I don't work you today..... that's just fine. Sooner or later ...... I will! I worked on the PFR3A some more tonight. I was semi successful in getting U11 off the board. I used some ChipQuick and was able to remove the chip; but I did lift off one pad in the process. No big deal as I scraped away some of the solder resist that led to that pad and soldered on a bit of discarded lead from a capacitor. Primitive; but workable. I placed the oscillator chip in the right way; and still have no receive function. The voltages are now correct, however. So as per Steve KD1JV in his e-mail to me; I guess the oscillator chip did not survive being powered up in a reverse voltage situation. I sent an e-mail to QRPKits, informing Doug that I need a new U11 clock oscillator. I copied in all my correspondence with KD1JV. Hopefully, I will get the new part soon. If U11 is soldered in correctly and does its job, it will provide a clock input to U7 so I can get the DDS LO output that I need to get the receive section working. I am extremely glad that I still have my K1 as my primary portable radio! I'd be up a creek without it. came today in the mail. You may remember me wondering if Paul W0RW was pedestrian mobile when I worked him during FYBO. He was! I got a photo QSL card in the mail confirming the fact. 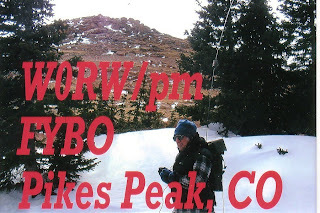 Paul was at Pikes Peak and was using his PRC319 military portable radio with a 10 foot whip at 5 Watts. He gave me a 599 report (handwritten). In the photo he was quite bundled up and the snow cover in the foreground looks pretty deep. I will try and hook up the scanner to the shack laptop later to see if I can possibly scan the card and post it here. There! I managed to scan it in. Thanks for the card, Paul! I awoke this morning to find that a good 4 inches of snow had fallen overnight. I shoveled the driveway and headed in to work. The drive wasn't bad because all the sane companies (not mine) decided to close up shop for the day to allow their employees to stay home. It snowed on and off all day; but really got going around 3:00 PM. They let us leave early, at 4:00 PM; and the drive home was a real white knuckle affair. Visibility was very bad and there weren't enough snow plows out to keep up with it. I drove home using as a guide, the wheel ruts in the snow that the vehicles before me had made. When I finally did get home, I got to engage in my most favorite activity in the world. See the above photo for a clue to what that is! The snow is just really starting to taper off now, at about 9:00 PM. I would hazard a guess that we received somewhere between 16 - 18 inches of snow. The good news is that even with a lot of wet, clingy, heavy snow; the antennas pulled through. This morning I was really worried that the G5RV and my end fed Zepp might not make it. They are sagging a bit right now; but once the snow is off of them, they will both be fine. Anyway, Joey and Cara had fun - even if I didn't. I managed to snag one pelt in the 80 Meter QRP Foxhunt tonight; and that was John K4AVX. I was not able to hear Jay KT5E at all. 80 Meters was VERY noisy tonight. Maybe that has something to do with the snow. Yeah, it wasn't supposed to start around here until midnight; but around 9:00 PM it started coming down. The blizzard of '10 has begun! 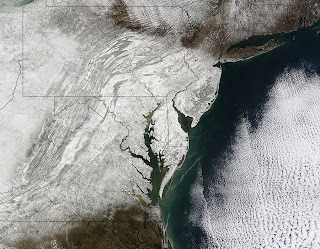 See that deep blue color over the state of New Jersey? The W2LJ QTH is smack dab in that deep blue section. That deep blue section means 12 - 18 inches of snow by the time this storm blows out of here tomorrow evening. AND, we were told at work today, that we ARE expected to be in tomorrow. Hopefully, as the storm intensifies throughout the day, they will let us leave early. Tonight, I will top off the tank of my Ford Explorer. Tomorrow, I will pop it into 4 wheel drive and will expect to spend lots of time on the parking lots - er, I mean highways. Sigh .... tomorrow is not going to be a fun day. Well, it can be done but is not easy. First, wick as much solder as possible off the pins on the sides of the package. Then hold the package with needle nose pliers and apply heat to the pads on one side of it, while applying a little torque to the package. You'll have to move the iron back and forth between the pads until both of them are hot enough to get the package to start to lift off the board. Then go do the other side and repeat. These things will take an amazing amount of heat without damage. The main problem is not lifting the pads off the board. Don't know if it will have survived being powered up backwards. You might want to test that by simply pressing the clock chip to the board without soldering to find out, as to have to remove it a second time would not be good for the board. Now, if you had a heat gun which you can focus the air flow just on the clock chip, that would work a lot easier and quicker. I wouldn't feel so bad about this if I had been the one to screw it up. But this is one of those "factory pre-installed" parts. You know, the ones that got installed so WE wouldn't screw up. I have no doubt that I will be able to successfully remove the chip. I hope it just didn't get screwed up by being powered up in an upside down state. Then I'll have to ask for a new one. I don't think that this is the kind of part that is easily found at Jameco, Mouser or DigiKey. And even if it is, the shipping costs would probably kill me. 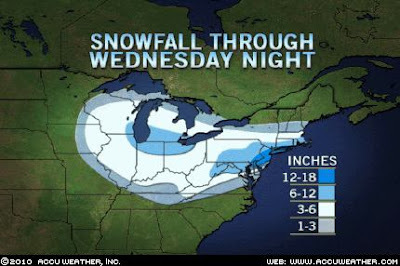 Then, to top off that good news is word of another impending snowstorm for tomorrow night and all day Wednesday. Antoher 6-12 inches is forecast. Good grief! 17 Meters was open again this afternoon. I worked Eduardo CO8LY in Cuba. He was calling CQ DX and was way over S9. He sounded more like he was down the block; than all the way just south of Florida. Unfortunately, it was one of those "599 TNX" kind of QSOs. We have worked several times before; and I wanted Eduardo to know his signal was really carrying. I guess New Jersey wasn't the kind of DX he was looking for. On the other hand, it looks like I am making some kind of progress with the PFR3A. I rewound T1 for the second time and re-installed with no improvement. So I decided that everything in the receiver circuit is probably pretty much just as it should be. That leaves the DDS. With my trusty VOM and schematic in hand, I began to take some voltage measurements. I checked the 78L05 regulator; and everything seemed fine there. Then I went to check U10, the 812C35 chip. Lo and behold! No 3.5V at the positive leg of C35! This led me to believe of course, that U10 might be defective; or perhaps soldered in badly (it is one of the SMT devices). Doing some troubleshooting as to why my receiver isn't working; I've come to believe there may be a problem with U10 (or a connection involving U10). I am currently not getting the 3.9V at the positive lead of C35 - only about .9V. Now, bear with me for a second. If you look at U10, there are 4 solder connections - the "top" and then the three "bottom pins". Using my VOM to check for continuity, I get a short from the left most bottom pin to ground. I am getting a short from the right most pin to the positive lead of C35. I am not getting a short from the middle lead to the cathode of D5, which I am assuming I should. Is the middle pin the input? The center pin of U10 is indeed the input and is connected to the metal tab on the top end of the part. In the PFR-3A, power to this pin comes from the +5V regulator. In the earlier 3 model, it comes from the raw DC via D5. Your the second one to have a problem here. I wonder if the 50 Mhz clock chip is in upside down? If you look carefully at the silver box between the regulator and the AD9834 chip, you should see a little dot near the upper left corner. If it is in the lower right corner, it is in upside down and could be pulling the regulator output low, since it sounds like its trying to forward bias a diode. Sure enough, the clock chip is indeed, upside down. I sent another e-mail to the list asking Steve for any recommendations in rectifying this. I have a feeling that I already know what this entails - and it's probably not going to be a simple fix. I do have some QuickChip hanging around somewhere in the shack to help me unsolder this chip. Maybe there's some light at the end of the tunnel? I had a good time operating in the FYBO contest today, even though I wasn't intrepid enough to do it from outdoors. As it was, it was only 57F in the shack at the start; and hovered around that temperature all day long +/- a degree here and there. I very much envy Bob N4BP having to operate in a bone-chilling 80F! Mark NK8Q had an awesome 599+ signal into NJ from PA on only 1 Watt. Ken WA8REI was sitting in his unheated shack for a temperature of 57F - same as me, operating from my pretty much unheated basement. It was good to hear and work Jim KK6MC, the famed Dr. Megacycle from QRP-L fame. And I wonder if Paul W0RW was pedestrian mobile? He's known for operating with a radio in his backpack and vertical attached to the backpack frame. In all, it was only 20 QSOs; and as you can see from the time jumps, I was either cruising the other bands or got busy doing other things. I did not sit for one uninterrupted lump of operating time. Best DX? KH7Y Fred, in Hawaii at 2000 UTC on 17 Meters. He was sitting on frequency, running stations and he heard me on my first call. I always get a kick out of working Hawaii from New Jersey on 5 Watts. I woke up this morning to find that everything outside was covered with a white, puffy blanket of snow. From the second floor of the house, where our bedroom is, it looked worse than it turned out to be. I got dressed and headed outside to clean the cars off and shovel, so that my wife Marianne could leave for the hospital, where she is a dialysis nurse. I took a yardstick out in the back yard, found a clear, undisturbed spot and measured only about three inches (7.5 cm) of snow. I'll take that any day compared to the 6-14 inches that they were predicting. Of course, it hasn't quite stopped yet, and unless heavier snow bands come through, I can see us only getting another inch or two, max. Some friends that I have in Virginia, whom I keep in touch via Facebook (gasp! ..... yes, Facebook!) have informed me that they have gotten over 20 inches of heavy, wet snow. Last night, the meteorologists on the local news, were explaining that the reason the snow was delayed in our area is that our air was so relatively dry; and that radar showed that it was already snowing, but that the snow was actually not making it to the ground. And I guess they were right, because unlike Virginia, our snow was not heavy and wet, it was very light and powdery. It was really not that much of an effort to clear using the snow shovel. Of course, the toughest part was clearing out the end of the driveway, where the snow plows had left a wall of snow. But even that wasn't so bad compared to other snow events we have had. Anyway, even though the snow is tapering off, I will not be participating in FYBO from outside. The winds are quite gusty (up to around 20-25 MPH) and there is a lot of blowing snow, which makes it difficult to see at times. Not an ideal situation. If it weren't for the winds, I'd have it not too bad, as the patio table is cleared off and would provide a nice operating platform. Instead, I will give up the X5 multiplier (it's only 25F outside) , for the X2 multiplier as it was 57 degrees down in the basement the last time I checked. Early reports said the snow was to start somewhere between 4:00 and 6:00 PM; just in time for the trip home from work. It's nearly 9:00 PM and the first flakes have not fallen. Hmmmm .... Does this mean the storm is moving more slowly than anticipated? If that's true, it will linger longer than expected and possibly dump a higher amount on us. Current forecast is calling for 6-14 inches. The farther South you are, the more snow you will most likely receive. In any event, the 2 Meter handheld is in the charging dock, as there will inevitably be a SkyWarn Net tomorrow on the K2GE, Sayreville NJ repeater. I'm sure they will be looking for local reports. I am an official member of SkyWarn, having taken the spotter training several times over a period of years. For the life of me, however, I cannot find the piece of paper with my official NOAA Spotter number. I think that got lost when I moved to South Plainfield from East Brunswick. My daughter's cheerleading stint for tomorrow got canceled as all the basketball games that were to be held at the school got postponed to another date. So I can sleep in for maybe an hour more than I would have otherwise. I will still have to go out and shovel so Marianne can make it to work tomorrow. Nurses go in regardless of the weather! Of course, I will get a few more gray hairs worrying about her until she is safe at home again. As if I don't have enough gray hair already! Tomorrow is FYBO and if things work out as the forecasters say, I will be doing my operating from the basement. Blowing snow with gusting winds is not my idea of "fun operating in the outdoors". I wonder if anyone has operated FYBO outside during blizzard conditions before? I don't think we QRPers are THAT crazy! ..... of snow. The weather prognosticators are all over the place on this one. I'm hearing anything from 1 -2 inches to over a foot of snow. It seems that the snow amount predicting business is about as easy and on target as predicting sunspot cycles! 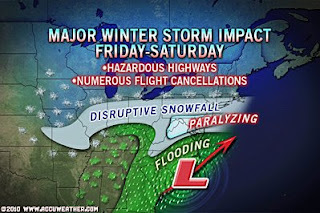 If you look at the above map, which appears courtesy of AccuWeather.com my QTH is out of the "paralyzing" snow area; but still within the "disruptive snowfall" area - whatever that means. It is supposed to start sometime tomorrow afternoon and last into sometime on Saturday. It looks like I'll be spending some quality bonding time with my snow shovel this weekend. Quite coincidentally, this Saturday also happens to be FYBO weekend! For those of you not familiar, this is where we overly dedicated QRPers venture forth into the Winter outdoors and operate in freezing cold (or not) conditions. Looks like the perfect weekend for it, no? Not really desiring my K1 to become a snowball, I will either operate from the back porch or perhaps from the basement, if I am already frozen solid from snow shoveling. If I operate from the back porch, I will freeze my buns off even more. If I operate from the basement, I'll probably just be cold as heck! Using my gray matter for a change, I went out and did the grocery shopping tonight in relative calm. If experience is a guide, as we get closer and closer to the actual snow event, the grocery store will become wilder and woollier. I don't need THAT aggravation! To my Ham friends in Southern NJ, PA, DE, MD, VA and WVA, I wish you a safe weekend! Take it easy with the snow shovels if you can; and stay warm and dry! who is going to visit your Website or blog. I receive nice comments about both from time to time; and it really makes the effort worthwhile. And in receiving comments, I even learn a thing or two from time to time. I received a nice e-mail from a Kristi Nichols, who is a communications teacher up in Massachusetts. She came across my Webpage and wrote to tell me that she was going to post it on her class Website as a link to Amateur Radio. In return, she sent me a link to a Ham Radio Resources Guide. In itself, this page contains very basic, overview type of information about Amateur Radio. But, if you ever find yourself teaching a beginner's class; or find yourself being asked by someone for good, basic information about Amateur Radio, it is a VERY good link to share. A new phenomena was witnessed by yours truly during the 80 Meter Foxhunt tonight. For once, 40 Meters was the quieter band of the two. I had fierce S9 noise on 80 Meters; but it wasn't the same band QRN that I get on 40. But it did make for harrowing listening on 80 Meters. Switching over to 40 Meters for a brief check of the band revealed a nice quiet band. This is usually just the opposite of what normally occurs. I had to turn off the AGC; and only then was I able to hear either Fox - N0IT or AB7R. I was able to send up a flare and have Dave N0IT pull me out of the muck; but I am not so hopeful for a QSO with AB7R. There's only 20 minutes left in the hunt, he's way down in the mud and there's a 10 over 9 net close by. Let's just say the odds are not with me tonight for a double pelt. At last! We're ready to go and you can now order an FT80 transceiver from our new website at http://www.azscqrpions.com. The old website URL will direct you to the proper place as well. For those who do not wish to use PayPal, please drop me a note and I will hold your place for 7 days while waiting for your check, cash, or money order. This should put everyone on a more or less even footing for ordering. US and Canada use the US ordering selection for PayPal. Let us know how you like the new website! If I didn't have such a backlog of kits that need to be built (and used), I would definitely place an order for one of these. The old saying goes "You can't have too many radios! "; but I'd bet my spouse would be willing to argue the point.